Hi SixPrizes readers! You’re probably reading this in the middle of State Championships even if you haven’t played in one yet. The format change from Regional Championships to States has been pretty enormous. Many cards were left behind in the switch from Expanded to Standard, and many new cards have entered the fray with BREAKpoint and Generations. I’ll be using some methods of thinking from outside Pokémon to evaluate cards in the new sets, such as understanding reprints, thinking by analogy, using precedent, extreme thinking, and thinking in snapshots. These thought processes lead to deck lists that you might want to try for State Championships and I’ll be sharing those as well. Before I close, I’ll be presenting a possibly unsurprising Vespiquen list that I used to get 2nd at Pennsylvania State Championships this past weekend. A notable Potion reprint … for once! Compared to the other methods of analysis I’m going to address, understanding reprints isn’t as deep as the others. In part, that’s what makes it the perfect place to begin. The reprints are cards we’ve seen before — exact copies — but the metagame in which they exist may be slightly or wholly different. A pretty substantial disclaimer is needed here — the game of Pokémon has been around long enough, that sometimes old cards that were excellent simply aren’t good enough anymore. Hitmonchan and Electabuzz from Base Set were reprinted in Stormfront without fanfare, but when Energy Removal 2 saw a functional reprint as Crushing Hammer, it has seen plenty of play since. Recently, many cards have seen reprints to keep their effects from ever leaving Standard, such as Cheren/Tierno, Juniper/Sycamore, Energy Retrieval, Great Ball, and others. In the case of Generations and BREAKpoint, there is only one Trainer card that returns to Standard that demands our attention: Max Potion. Max Potion has seen play in a variety of decks, whether as a surprise 1-of, or as a key strategic component to keep your Pokémon from getting KO’d. This is a great card for Aromatisse-based decks, just as it was before. There’s even a case to be made that Max Potion is better than it used to be, due to effective Basic Pokémon attackers getting more HP than ever before with Fighting Fury Belt. BREAKpoint reintroduces Skyla, but she faces a problem in my view — some of the reasons Skyla was great previously no longer apply. Most importantly, ACE SPECs are no longer in Standard, so Skyla is never grabbing you a card you’re strictly limited to a single copy of. 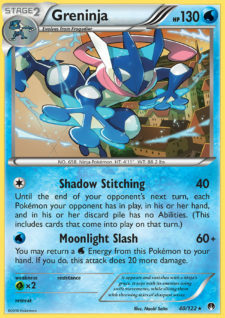 There are some very strong effects on Supporter cards in Standard, so if an Item or Stadium is critical to your strategy, you’ll probably first play more copies of it along with Trainers’ Mail before adding Skyla to your deck list. That isn’t to say she won’t see play — but her potential impact will definitely feel less important than Max Potion. Garbodor with Garbotoxin also makes a return in BREAKpoint. Even if Garbodor has a new (and more irrelevant) attack, Garbodor still has a friend in Seismitoad-EX with Quaking Punch, so players may find themselves (or their opponents) in plenty of familiar situations at State Championships. It’s important to note that key tools for damage that were available to the Toad/Garb decks of the past are not in Standard right now (like Hypnotoxic Laser and Virbank City Gym). Furthermore, Parallel City can give Seismitoad fits even if Garbotoxin is functioning. This is kind of like that. Many of you reading this have a great shot at making those educated guesses he’s talking about. If card effects have been competitive before, they’re worth looking at when they come around a second time. If you know me, you’ve probably guessed that Vespiquen with Bee Revenge is possibly my favorite example of this, since it’s the same idea as Flareon’s Vengeance. There are a lot of other examples that have seen various levels of play, like the Lugia-EX from Ancient Origins harkening back to Mewtwo-EX NXD’s once omnipresent X Ball. The important consideration is if there is anything that fits this mold for State Championships? Indeed there is. Puzzle of Time requires you to have 2 copies of it at once for a very powerful effect. This concept was first seen in Stormfront with Poké Drawer +, Poké Blower +, and Poké Healer +. Poké Drawer + probably saw the most play of that cycle, and it showed players that it was worth jumping through some hoops to get to the cards you needed. Puzzle of Time might be better than Poké Drawer + for the decks that can utilize it properly. That’s because it’s incredibly easy for players to burn through their deck and resources, and Puzzle of Time will allow them to get back the pieces they need to win. While Poké Drawer + might be useful if reprinted today, it’s easy enough to draw straight through your deck with a myriad of options and so it might not see use. Further, cards like Teammates give an incredibly similar effect, meaning that Puzzle of Time can let you diversify your options. Not to mention, Puzzle of Time and Teammates are a pretty snazzy combo. An Item card that got a lot of attention at the most recent Florida Regional Championships was Bursting Balloon. In many ways, it’s similar to Rock Guard. The bonus is that you get to include multiple copies of this card in your deck, so you can start to rely on the added damage more than you might with only your ACE SPEC. Rock Guard helped players using Toad/Bats get to KOs soon and obliterate whatever resources their opponent was able to eke out onto the field. For Trevenant BREAK decks, with their Item lock and damage-counter spreading, Bursting Balloon helps hit that same note — sometimes to the tune of 240 damage per game. That translates to Item cards doing enough work to KO a Pokémon-EX or even a Mega Pokémon. A spirit rekindled? Or ghost of its former self? Precedent is something used in many legal systems, where when presented with similar issues or facts a court (often a judge) will rule in the same way. Sometimes lawyers will have to show why the new situation diverges from the precedent. Choosing between these two paths is a challenge encountered when evaluating new cards against a current or old precedent of success. For example, Bursting Balloon and Rock Guard don’t relate to one another in the same way that Regice AOR and Jolteon-EX do. At first, I wasn’t sure why. I had a nagging sense it wasn’t arbitrary. I’d have to make the case to myself on the theory before I started investing too much time thinking about deck lists or actually grinding out games. Jolteon ends up being a winner when we use precedent to analyze it, and as a result I crafted a relevant deck list. Feel free to skip to it. First though, let’s check out some cards that fail the test for a solid contrast. Froslass from Generations (technically, the Radiant Collection 2) was a card that excited me at first glance. Froslass’s Ability, Drag Along, is nearly identical to Stormfront Gengar’s Fainting Spell. Gengar made the Top 4 at World Championships in 2010 when Frank Diaz used it. On one hand, Froslass is a Stage 1, so it should in some ways be inherently better to use than Gengar, but somehow it falls short. 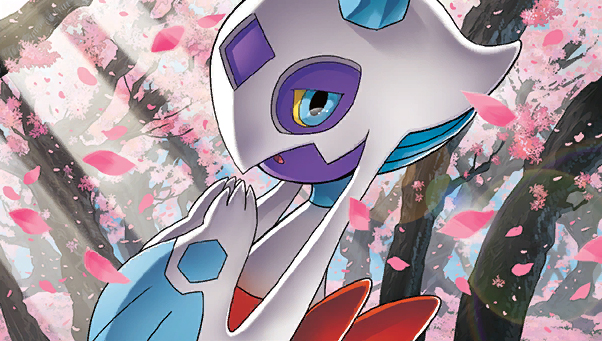 Unlike Gengar, Froslass isn’t a quick threat that demands to be KO’d, and today’s format comes with tons of answers that players are already utilizing for other problems or part of their core strategy. To name a few common examples, Lysandre, Hex Maniac, and Crobat. Manaphy-EX is another loser on this front. 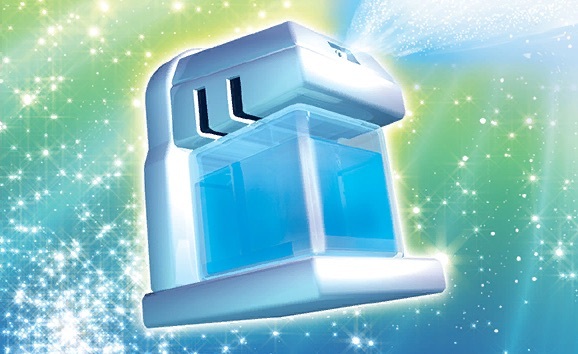 Aqua Tube is just like Dark Cloak but for Water types. What isn’t to love? Perhaps most importantly, Manaphy-EX has 60 less HP than Darkrai-EX. Manaphy’s attack isn’t dependable, and it lacks the support of Dark Patch or a partner as good as Yveltal. Perhaps the most dramatically, the top Water deck in Standard is Greninja, and Greninja retreats for free. Speaking of Greninja, Greninja is an interesting case of using precedent to see why it’s a winner. It doesn’t quite line up exactly, but with some judgment you can see why it’s very effective. 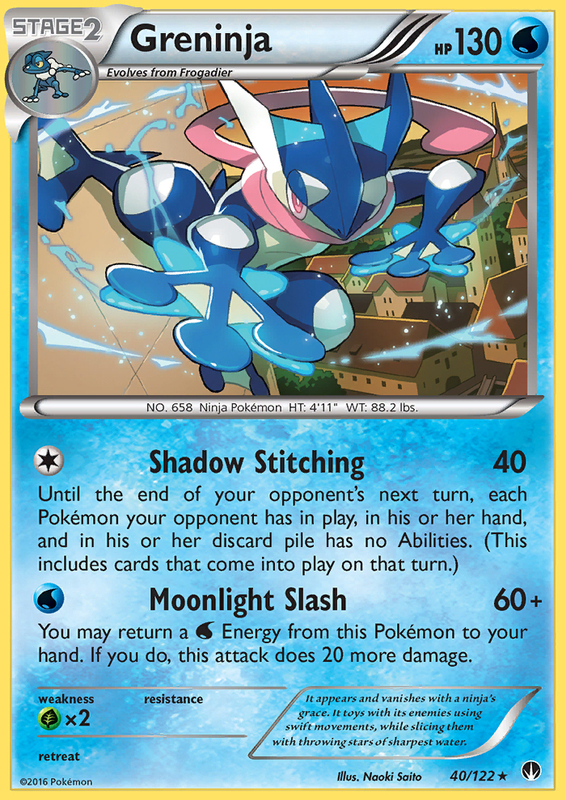 Shadow Stitching is a fantastic attack, and anyone who remembers the 2007-2008 season where Secret Wonders Gardevoir ran wild will see at least half of why. Greninja can totally shut down your opponent’s Abilities just like Gardevoir — but for a single Energy and with more Hit Points. It’s nearly as much damage too. Greninja BREAK is like a harder to access but more powerful version of the Greninja XY’s Ability. The two of them together speak to a pattern we’ve seen in many decks that succeed at the World Championship level — when they make multiple cards of the same Evolution line that work together, success happens. Eeveelutions in 2006, Gardevoir in 2008/2010, and Gengar in 2010 are great examples of this, even if it’s a high-level concept that isn’t directly related to the comparison at hand. Tactically, your opponent is frequently squeezed between a rock and a hard place because you’ve got multiple threats on board, and to make matters worse, none of them are Pokémon-EX. Let’s look at a big winner across these sets when considering precedent: Jolteon-EX. The secondary market price shows that Jolteon-EX is one of the most hyped cards from Generations. Jolteon doesn’t completely replace Regice AOR, but it still demands our attention. 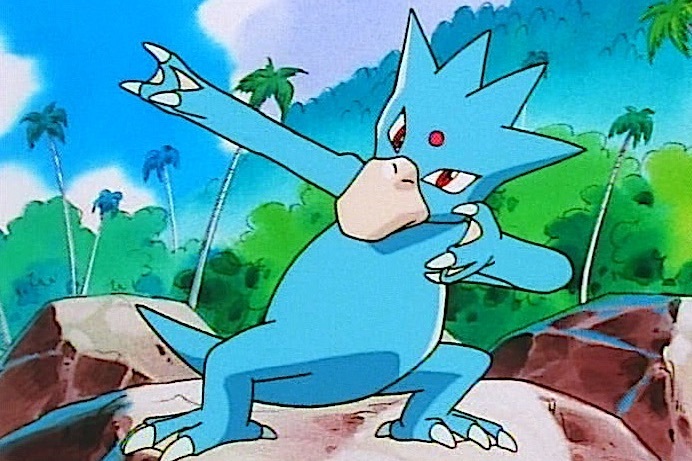 Regice can’t stop another Regice, Yveltal, Entei, or Raikou. Jolteon-EX can stop all of them, but will struggle with some of the Mega Pokémon that might pop up in your metagame. Jolteon-EX is even searchable with Hoopa-EX. Both pair well with Mega Manectric and Rough Seas, so you don’t need to choose between them when constructing your deck, but you may need to choose between them on any given Ultra Ball. There is a meaningful tradeoff between these two cards, and it represents game design that I genuinely admire even if I don’t end up utilizing this strategy at State Championships. Extreme thinking makes you ask yourself what’s possible with cards, and then you challenge yourself to make it probable through your deck list and plays. Cards that revolve around filling your Bench used to mean thinking about 5 Benched Pokémon, but now with Sky Field we have to consider 8. Vespiquen succeeds at extremes. Other times, this means doing things faster than they’ve ever been done before, or more times than previously, like using Quaking Punch every turn. There may not be any huge examples in Generations, but BREAKpoint brought along with it the latest incarnation of renowned powerhouse Darkrai-EX. Dark Pulse has a base damage of 20, and for each of your Dark Energy attached to all of your Pokémon does an extra 20. In most scenarios, you’re looking to deal between 100 and 180 damage for a KO. That’s only 4 to 8 Energies, which seems very doable; in fact, it turns out to be much easier in Expanded with access to Dark Patch. To be fair, you might need to preload some damage onto high-HP Mega Pokémon. In a world where you can cheat Energies into play via Oblivion Wing, Max Elixir, and then repeat Max Elixir with Puzzle of Time, Darkrai-EX BKP is a main attacker worth investigating. None of the typical cards to include with him go against what you’re trying to do — e.g., Double Colorless Energy, Yveltal-EX, Muscle Band, Fighting Fury Belt, or even Float Stone. In particular, an engine of cards that helps you get Gallade into play will help your Max Elixirs be successful more frequently since you’ll be thinning the deck of non-Energy with Battle Compressor and Trainers’ Mail, but also because you’ll be using a combination of Premonition and Puzzle of Time to ensure extra successes. Note: You’ll notice that Zoroark, a mainstay in Standard format Dark-type decks, is notably absent. Even though Max Elixir/Darkrai-EX is cool, interesting, and possibly explosive, it doesn’t have the same overall strength that Zoroark does at present. There isn’t space for both to be optimized (they each require 7 or more spaces). If Darkrai gets a boost that doesn’t also help Zoroark, that will be the time to revisit this deck. Thinking in snapshots is really difficult, and more than anything it comes from experiencing these moments in games. A snapshot is when there is a simple play or card usage on your part that nets a really big effect which can happen frequently. Frequently may mean within a key matchup or across many different ones. It’s just as important to understand what a snapshot isn’t: an elaborate scenario where everything goes your way. Unlike our other methods of evaluating cards, snapshots are more likely to reveal individual card choices within a deck than the cornerstone of a new archetype. Another important note on cards that are good in snapshots is that they’re generally of very good utility to begin with. In early Pokémon theory, someone highlighted for me how effective PlusPower could be. If I used it to KO my opponent’s Pokémon with multiple Energy attached, it was as if I got to use multiple Energy Removal cards and maybe even some Potions. In the current format, Fighting Fury Belt or Muscle Band have the same snapshot. The Greninja deck list I shared earlier has a snapshot moment with Greninja BREAK: you’ll be able to discard a Water Energy and potentially KO a low-HP Basic. While Greninja is tough to get into play, there are plenty of targets that will instantly net you a Prize card: Joltik, Pumpkaboo, Bronzor, Zorua, Combee, Froakie, and Remoraid to name a few. Puzzle of Time opens the door to any number of opportunities. 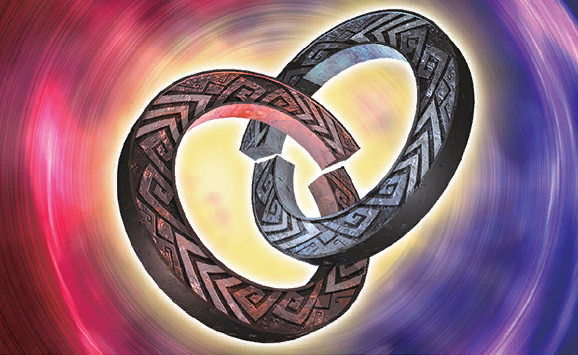 One of the most groundbreaking is being able to recur Double Colorless Energy. Right now, the only other way to recur this card is through Milotic from Primal Clash. Getting Milotic out not only requires waiting a turn but opens you up to Feebas as a Prize liability. Puzzle of Time delivers the same snapshot but faster. Even though it also requires using 2 cards, the payoff is even greater than Milotic. As an added bonus, a single Puzzle of Time isn’t totally useless the way a lone Milotic is. Reverse Valley, for the Darkness-type benefit, isn’t always a snapshot — it usually requires a Muscle Band. Reverse Valley helps Yveltal XY hit 60 damage for 1 Energy in conjunction with a Muscle Band. Reverse Valley with Muscle Band can also help Zoroark need 1 less Benched Pokémon to get a KO with Mind Jack. As much as Trevenant BREAK is a fantastic card, it doesn’t really represent a snapshot. The card in that deck that does probably won’t surprise you: it’s Phantump. Ascension Basic Pokémon have always been good, but perhaps few are as good as Phantump due to the Ability of Trevenant XY to shut off Item cards for your opponent. Phantump isn’t giving you a totally new opportunity — Wally is in Standard — but there is a large leap in your ability to get a turn 1 Trevenant when you can use your Supporter in some other way. Dimension Valley makes it even easier still to get to use Ascension. A card that I personally really enjoy for its snapshot capability is Revitalizer. Being able to go 2 for 1 is always a big effect, but in conjunction with Forest of Giant Plants you’ll be able to make a Grass-type Evolution out of seemingly nowhere. If you’ve been following me on social media or reading my earlier SixPrizes articles, you’ll jump to thinking about Vespiquen and you’d be right. However, Revitalizer will snag Vileplume parts or even an Ariados line if you choose to tech it in. The utility for the card goes up even further when you consider that it can retrieve cards for Grass-type Evolution lines that don’t match, but that simply represents the general utility and not the snapshot I’m zooming in on. 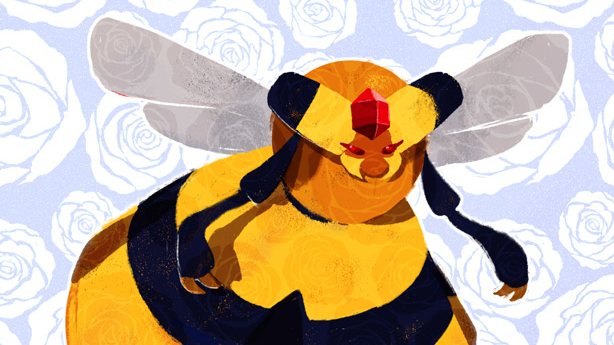 All you have to do is … BEE-LIEVE!! Zoroark is the primary partner for Vespiquen the same way that I had used Flareon in Expanded. What are some of the advantages to the tradeoff? Beyond the bulleted list, there is a really interesting nuance to the metagame that allows Zoroark to shine right now — it’s the way Night March motivates other players. Pokémon-EX are generally pretty poor against Night March because they don’t trade well. Their inflated Hit Points don’t stand up to the glass cannons of Joltik and Pumpkaboo. The lower HP Pokémon that do a better job of trading with Night Marchers, and Night Marchers themselves, all fall before Zoroark’s Mind Jack. Between Zoroark, Vespiquen, and Yveltal, I would end up having a multitude of relevant single-Prize attackers against Night March and other non-EX decks. It was a huge strength throughout the day and I wish I had used more Zoroarks. Yveltal XY and Landorus FFI were both in contention for that same space in the deck. Either could help me attach a basic Energy, load up some damage, and build other threats. Attackers that recur Energy would help me recover resources lost as I dive through my deck trying to discard more Pokémon. Both could 1HKO a Joltik, but only Yveltal could do the same to Pumpkaboo or Phantump. Yveltal-EX also paired better with the regular Yveltal. Yveltal-EX had a few purposes for me. In large part, I knew it would give me a big leg up on Trevenant. I hadn’t found a list for Trevenant that I really liked but assumed that since it was such a strong card with so much support other people would come up with some great lists, and so I wanted to have multiple efficient solutions to them. Yveltal-EX was part of that game plan, though I didn’t play against a single Trevenant deck at States. Multiple Jirachi were intended to help me either beat decks like Toad/Tina or try to win a resource war against decks relying heavily on Double Colorless Energy. In two games Jirachi helped me do the latter. 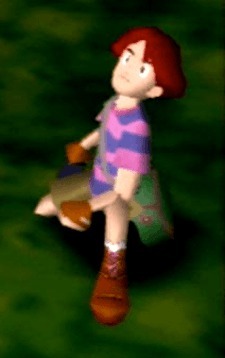 I didn’t get paired against any Toad/Tina deck at States. Seismitoad-EX was the result of an ongoing experiment. The card had performed really well on its own obviously, and had been a highly effective tech card for Frank Diaz during his multiple Regional Championships performances. I figured since my current list had a much greater ability to switch into a new attacker thanks to Stand In, I could afford to run a situational attacker who might eventually win me a game. Across the entire day, there was only a single game which Seismitoad won for me. In the same match, I would lose a game by having Seismitoad in my deck as well since he gives up 2 Prize cards. As I make the final changes to this article, I can’t decide if perhaps he’s better suited to a metagame to come or if I should remove him from the deck entirely for new tricks. In a surprising turn of events, I skipped Unown. It was a consistency card and a potency card, but not as potent as additional attackers nor as consistent as Trainers’ Mail. They helped contribute to an explosive turn, but sometimes would clog up my hand with resources I didn’t want to discard to Professor Sycamore. Trainers’ Mail didn’t have that issue. As I move on to the next weekend of States, I could see myself finding spots for some Unowns, but I’m not sure if I’d max them out at 4 copies. On the topic of Trainers’ Mail, it felt great to get the one-two punch of Battle Compressor to eliminate Pokémon, and then play a Trainers’ Mail for a chance at juicier options than I’d otherwise have. Then again, from time to time, I’d miss completely. I view this as something that simply happens, and it’s a tradeoff I’m forced to accept for all the games that Trainers’ Mail wins me directly or indirectly. Whether it’s understanding reprints, thinking with analogies, using precedent, extreme thinking, or thinking in snapshots, I hope my analysis helps you appreciate or rule out the cards from Generations and BREAKpoint as appropriate. I hope they’re ideas that stick with you for the next round of spoilers from Japan! When not diving super deep into a single deck, I like to try and focus on the way that we as players think (or should try to think) about Pokémon. I hope my examples are demonstrative and informative. I aspire to not only shine a light on new concepts for learning players, but to help experienced players have new frameworks for the concepts that they’re succeeding with. Please share in the comments if you’ve got some examples of the ways to think about Pokémon cards I’ve mentioned, or if you’ve got some questions about State Championships. It’s been a huge pleasure becoming part of the SixPrizes community over the past few months, and I hope you’ve all enjoyed this. Good luck at States!